Dakdoritang or Korean stewed chicken is a very easy and simple dish to cook in minimal time.The main ingredients of this dish is Kochujang.Kochujang is usually purchased in jars already prepared at Asian supermarkets and is an essential staple of the Korean kitchen. Since I'm addicted to Kdrama I try to sample all the Korean dishes by cooking myself at home. I used boneless chicken thigh,potatoes,carrot,onion ,napa and bell pepper to make this hearty delicious exquisite taste dish..
1:Use a stock pot with oil and garlic at medium high heat.Saute garlic for 30 second before add in water,kochujang (red chili pepper paste) and Dwenjang(fermented from soybeans). 2:Bring to boil,add in potato ,carrot and chicken..Simmer for 10 minutes before add in the rest of the ingredients,sugar and sesame oil . 3:Cook for another 5 minutes.Check the seasoning before dish out and serve warm with steamed white rice. Every Chinese or Asian have their own version of Shumai.Shumai is also called as Pork Dumplings .It's a traditional Chinese dumpling served special at dim sum but for folk like us who can get Shumai at any Japanese or Chinese restaurant at anytime and day..For me I like to make Shumai with my own special ingredients.. The fact is making Shumai at home is really easy and simple..All you need is some wonton skin ,minced meat ,shrimp,soy sauce,pepper powder,sesame oil ,oyster sauce and tobiko!! Viola!! 1:Prepare water in steamer or wok at medium high heat.Combine all (A) ingredients in a medium large bowl.Use a wet paper towel or wet clean cloth to cover the wonton skin,prevent from drying out. 2:Center the wonton skin on your palm.Scoop 1 tsp of meat mixture onto the center of the skin,then wrap it up from center up ,try to close all the edges together.Repeat the same procedure until all the meat mixture gone. 3:Place shumai in steamer basket lined with parchment paper underneath.Space each shumai to prevent from sticking together when cooked. 4:Place shumai in steamer when water rolling boil for 15-20 minutes or until cooked.Top some tobiko on the shumai opening.Serve warm with mustard or soy sauce. I know Chinese New Year is almost over in few day but I just make bak kwa or it's called as "long yoke" few days ago..I wonder why bak kwa called as "long yoke"? Isn't "long yoke" translated to Cantonese as deer meat? Pardon my ignorance. When I was blog hopping during Chinese New Year, I saw many blogger make their own bak kwa themselves..At first I thought making bak kwa yourself at home is really hard and complex but after looking thoroughly all the recipe online,I don't think so. I would love to experiment it myself..This is my 1 st time making bak kwa at home and I found it's really easy and not complicated at all!! As we know Malaysia bak kwa selling in NYC is super expensive not to said the meat been sitting there for a while.So next time if you miss bak kwa,why not try to make yourself ..The only down side I have is to use my broiler to grill the final part of bak kwa.My new oven broiler is at the bottom of the oven which I can't see when it's grilling.That the reason why some of the bak kwa was burnt on the side.Maybe I should use my bbq pit to grill the meat but the weather outside is below 30F!! Anyway,who can beat and resist fresh homemade bak kwa ? Not me!!! I been chowing my homemade bak kwa with bread for breakfast daily..Yummy!! 1:Combine ground pork with all the seasoning,mix well.Pre-heat oven to 250 F.
2:Prepare 2 large baking sheet with parchment paper or baking sheet .Spread meat as thinly as possible to cover the whole sheet. Use spatula or flat knife to smooth surface. 3:Bake in oven for 15 minutes or until firm to the touch.Remove from oven and using a scissor or pizza knife to cut meat into your desire size or shape. 4:Turn oven setting to broil or you can use open grill to grill the final step of bak kwa.This is critical step,must watch the flame in order not to burn the meat. 5:Serve bak kwa with bread as sandwich or as it's..
#6:then use broiler or open grill to grill the meat for the final part.. I always braise chicken with Chinese wine and dry pepper all the time.Some time I used Mirin and sometime I used Shaoxing wine but this time I used Mijiu.Mijiu 米酒 is the generic name for Chinese fermented rice wine, similar to Japanese sake. It is generally clear, and is used for both drinking and cooking. Mijiu intended for cooking often contains 1.5% salt and alcohol content by volume: 12-19.5%. The reason I used chicken wing to braised instead of other part of chicken it's becos chicken wing have smooth texture and I feel good when eating the tips part..On top of that the gravy have spicy tangy sweet flavor that suitable to eat with steamed white rice on a cold weather!! 1:Heat deep large skillet or stock pot with oil ,dry pepper and garlic at medium high heat.When garlic and dry pepper is fragrant,add in chicken wings,water,mijiu,caramel sauce,soy sauce,chicken bouillon powder and sugar,mix well. 2:Simmer the chicken wings at medium heat for 30-40 minutes or until cook.Check the seasoning.Remove chicken wings from heat.Dish out and serve warm with steamed rice. Wishing all my dear readers,friends and family a Happy Chinese New Year! 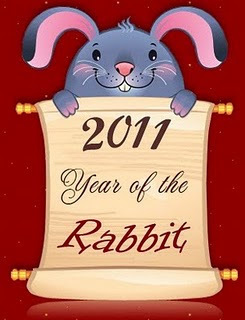 !..Gong Xi Fa Cai..May this Rabbit year brings happiness and prosperity to you and family! !